HBNO™ Angel Stress Relief is an excellent blend to uplift and relax individuals who are in need of stress relief. Bright and soothing a must have blend. 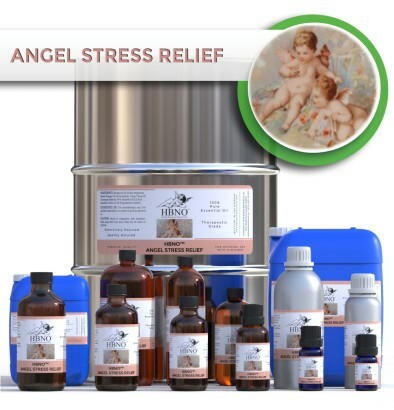 HBNO is pleased to offer HBNO™ Angel Stress Relief essential oil blend in small packing to bulk and wholesale quantities. We can supply any amount of oil to anywhere in the world. We can also formulate according to your needs to meet your target price for bulk quantities. Bergamot is a Mediterranean citrus fruit that is not edible but omits a wonderful scent. Calabria, a region of Italy, produces most of the Bergamot in the world. Bergamot scents many colognes and flavors Earl Grey tea. In traditional Italian folk medicine the oil was used to fight fever and infection. Bergamot essential oil helps with a myriad of ailments. It is an effective skin healer for eczema, acne, blemishes, varicose veins, and hemorrhoids. It also combats mouth infections and herpes (both genitil and mouth). Because of it’s ambrosial scent it works as a deodorant and insect repellent. It also helps scar tissue form and helps to reduces cellulite. Recent studies have indicated the capacity of Bergamot essential oil to effectively balance the hypothalamus. The oil’s scent is uplifting and helps to overcome anxiety and compulsive behaviors. The scent of patchouli is developed by oxidation, as the leaves are aged and fermented prior to distillation. As the oil matures the translucent yellow oil turns a viscous brown and develops its unique fragrance. Patchouli is used in all three major world medical systems, traditional Chinese, Ayurvedic, and Greek medicine. Patchouli essential oil is very effective for skin related issues. Patchouli works as an astringent, making it useful in treating visible signs of aging, sagging skin, enlarged pores, varicose veins, and wrinkles. Patchouli oil stimulates the regeneration of skin cells and reduces inflammation from itchy and infected skin, acne, eczema, dermatitis, sores, scar tissue, skin infections, and insect bites. It is also a mild aphrodisiac. The orange tree is autochthonous to Asia and is now widely cultivated in subtropical regions worldwide. It is postulated that the Moors brought the orange to Spain, then introduced the citrus to the New World in the 1500s. Throughout the 18th and 19th centuries, sweet oranges were considered a delicacy and only for the privileged few. It is now largely grown in the USA and Brazil. The essential oil is derived by cold pressing the peel of the sweet orange. Orange essential oil is good for oily complexions. It is a powerful disinfectant, promotes circulation, serves to assuage sore muscles and aches, assists with insomnia, and clears the lymphatic system, thus boosting the immune system. The oil has a sedative effect on the nervous system, helping to relax, calm, and regenerate. It is considered an antidepressant and helps to surmount mental fatigue. It is also thought to rid termites. Ylang ylang essential oil is known to reduce stress and induce calmness. The aroma is exotic and rich, penetrating the vicinity and imbuing sensual and aphrodisiac sentiments. Newlyweds in indonesia place a flower on their pillow during the honeymoon. It is used to increase the thickness of the hair shaft and stimulates hair growth. It has a balancing effect on sebum production production reduces split ends. Ylang ylang assists with hypertension, palpitations, rapid breathing, acts as a scalp tonic, acne, and fever. Ylang ylang essential oil is antiseptic, aphrodisiac, antidepressant, hypotensive, sedative, euphoric, tonic, and nervine. Grapefruit essential oil is considered a powerful antioxidant, helping to scavenge free radicals. The astringent properties of assist in reducing obesity, cellulite, and tightening pores on the face, resulting in a more youthful complexion. The inherent disinfectant properties make grapefruit oil suitable for oily and acne prone skin. It also acts as lymphatic tonic, cleansing and boosting its function, thus improving the immune system. It is considered a stimulant that increases mental agility and memory.